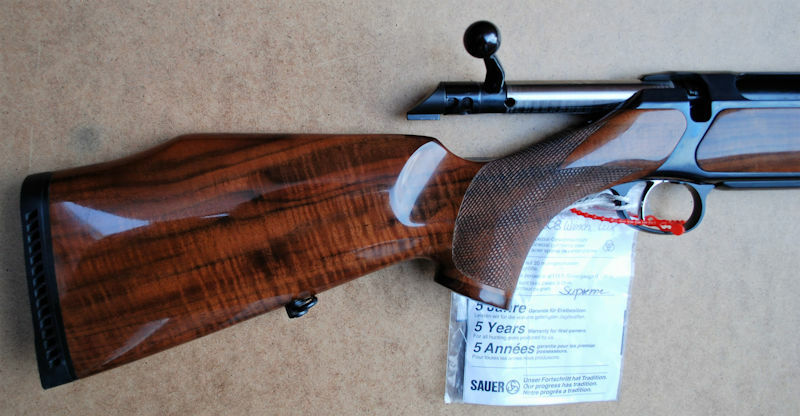 SAUER Model 202 BOLT ACTION .308 RIFLE. BRAND NEW, UNFIRED and still with Makers Warranty Card attached! This has been tucked away for a few years now and is actually an older model of the 202, which superseded the 200. This has the original safety as found on the 200 model and consisting of the button set inside the trigger guard with the corresponding button to put it to safe on the top of the tang to the action (pushes vertically up and down). Some, myself included, actually prefer these older versions / models (and YES, I have one in my own cabinet). In recent years it seldom works out that ‘improvements’ find their way onto new versions because they are actually better…..more likely because they are actually a bit cheaper to the unit costs! This is what used to be classed as the ‘LUX SUPREME’ version so supplied in a Very Pretty Higher Grade Walnut stock with Rosewood tip to the grip cap as well as Schnabel forend and the usual palm swell to offer a very positive grip and hand position. Always a great feature to ensure your trigger finger is in the correct position. Not only is this well grained but it also features a very tight ‘Tiger Stripe’ pattern across just about the full length of the stock too so certainly even more unusual than normal. 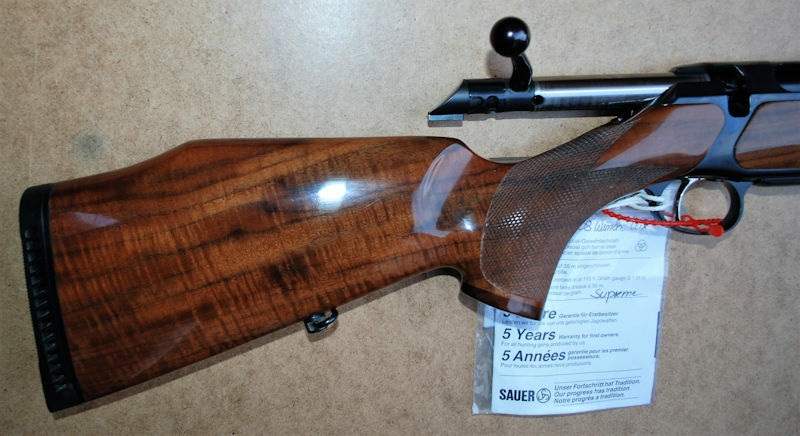 In reality the rifle is actually prettier than the pictures, it’s just difficult to capture the highlights in the timber with the camera. With the interchangeable barrel system these rifles also open up opportunities to allow a choice of calibres to cover just about any shooting scenario anywhere on the planet. That said the .308 IS the most versatile calibre available with bullet heads ranging from approx. 70gr through to 220 ‘heavy hitters’ so unless it’s something from the ‘dangerous game’ categories this one rifle SHOULD be sufficient for anything the average shooter ever want or need. In effect it is a ‘one rifle for life’ and whilst not the cheapest short term purchase you will never need to think about buying another. Detachable magazine as standard and metal work pre drilled to take a set of scope mounts and / or open sights if required these are certainly HIGH END rifles. I have the same calibre and rifle in the 200 version, along with a couple of alternative barrels and they ARE a delight to shoot. Anyone wanting something a little classier than the general ‘run of the mill’ available this could well be what you have been looking for.